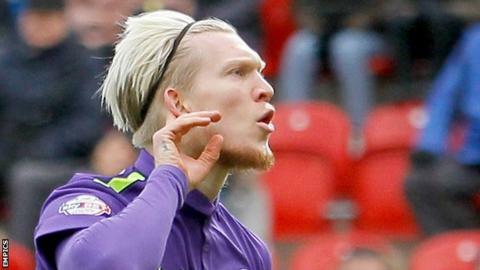 Simon Makienok scored twice to help Charlton Athletic end their 11-game winless run by beating Rotherham. The Dane opened the scoring early on from Zakarya Bergdich's cut back before Chris Burke levelled for the home side. Angolan Igor Vetokele then finished off a well-worked counter-attack to put Jose Riga's side ahead at half-time. Makienok headed in to make it 3-1, then Jonson Clarke-Harris blazed over a Millers penalty before Ademola Lookman rounded off victory in added time. The away side had not won a Championship game since beating Birmingham City on 21 November but took the lead after just four minutes when Bergdich cut the ball back for Makienok to smash in. They did not stay in front long as Rotherham's Burke scored his first goal for the club on his home debut, receiving Danny Ward's pass before slotting under goalkeeper Stephen Henderson. After Grant Ward had shot wide for the Millers, Johann Berg Gudmundsson crossed for Vetokele, who turned in from close range after a rapid counter-attack. Henderson then produced a diving save to keep out Danny Ward's left footed strike before Makienok met Gudmundssen's pinpoint delivery to give Charlton a two-goal lead. Rotherham had a chance to get back into the game when Clarke-Harris was brought down by Jorge Teixeira, but the striker smashed his attempt over. Substitute Lookman slid in a fourth to complete a hat-trick of Gudmundssen assists. It gave Riga his first win first since rejoining on 14 January, leaving the Addicks 23rd, just a point behind 21st-placed Rotherham. Match ends, Rotherham United 1, Charlton Athletic 4. Second Half ends, Rotherham United 1, Charlton Athletic 4. Goal! Rotherham United 1, Charlton Athletic 4. Ademola Lookman (Charlton Athletic) right footed shot from the centre of the box to the bottom left corner. Assisted by Johann Berg Gudmundsson with a through ball. Attempt missed. Luciano Becchio (Rotherham United) header from the centre of the box misses to the right. Assisted by Andrew Shinnie with a cross. Offside, Rotherham United. Kirk Broadfoot tries a through ball, but Luciano Becchio is caught offside. Substitution, Charlton Athletic. Ademola Lookman replaces Igor Vetokele. Attempt missed. Danny Ward (Rotherham United) header from the centre of the box is close, but misses to the left. Assisted by Joe Mattock with a cross. Attempt saved. Luciano Becchio (Rotherham United) header from the centre of the box is saved in the bottom left corner. Assisted by Andrew Shinnie with a cross. Corner, Rotherham United. Conceded by Stephen Henderson. Attempt blocked. Jonson Clarke-Harris (Rotherham United) left footed shot from outside the box is blocked. Assisted by Kirk Broadfoot. Attempt missed. Richard Smallwood (Rotherham United) right footed shot from outside the box is high and wide to the right. Assisted by Joe Mattock. Attempt missed. Jonson Clarke-Harris (Rotherham United) header from the centre of the box is close, but misses to the left. Assisted by Richard Smallwood with a cross following a corner. Attempt blocked. Jonson Clarke-Harris (Rotherham United) left footed shot from the left side of the box is blocked. Assisted by Grant Ward. Kirk Broadfoot (Rotherham United) wins a free kick on the left wing. Hand ball by Jonson Clarke-Harris (Rotherham United). Attempt missed. Jonson Clarke-Harris (Rotherham United) left footed shot from outside the box is close, but misses to the right. Assisted by Andrew Shinnie. Foul by Luciano Becchio (Rotherham United). Penalty missed! Bad penalty by Jonson Clarke-Harris (Rotherham United) left footed shot is too high. Jonson Clarke-Harris should be disappointed. Penalty Rotherham United. Jonson Clarke-Harris draws a foul in the penalty area. Penalty conceded by Jorge Teixeira (Charlton Athletic) after a foul in the penalty area. Goal! Rotherham United 1, Charlton Athletic 3. Simon Makienok (Charlton Athletic) header from the centre of the box to the top left corner. Assisted by Johann Berg Gudmundsson with a cross following a corner. Corner, Charlton Athletic. Conceded by Lee Camp. Attempt saved. Johnnie Jackson (Charlton Athletic) left footed shot from outside the box is saved in the top left corner. Foul by Farrend Rawson (Rotherham United). Attempt missed. Grant Ward (Rotherham United) right footed shot from outside the box is high and wide to the right. Assisted by Andrew Shinnie.